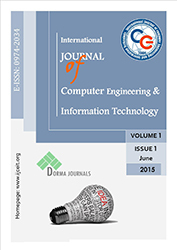 International Journal of Computer Engineering and Information Technology (IJCEIT) , abbreviated key title: Int. j. comput. eng. inf. technol / ISSN: 2412-8856 (Online) has been established since 2015. IJCEIT is a scholarly online, open access, peer-reviewed, interdisciplinary, monthly, and fully refereed journal focusing on theories, methods and applications in computer engineering and information Technology. This journal financed by Dorma Trading Est, publisher. It is an international scientific journal that aims to contribute to the constant scientific research and training, so as to promote research in the field of Computer Engg and IT. IJCEIT covers all areas of Computer engineering and Information Technology, For more Information please refer to: Call For Paper . We publish original research articles, review articles and technical notes. The journal reviews papers within two weeks of submission and publishes accepted articles on the internet immediately upon receiving the final versions. IJCEIT invites authors to submit original and unpublished work that communicates current research on Computer Engineering and Information Technology. Original works are invited in form of research paper/ manuscript. Manuscripts should follow the style of the journal. IJCEIT Paper Format.